This story was created for a sponsor, which paid for its creation and inclusion on this site. 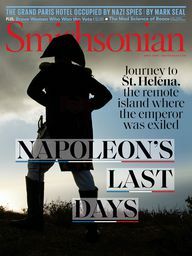 For more on Smithsonian.com’s editorial guidelines click here. 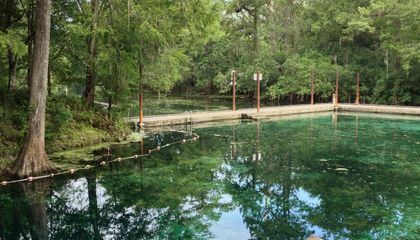 Across Florida, vast underground aquifers push natural springs to the surface, creating pools that dazzle like gems under lush green forest canopies. With water as clear as glass and the temperature a constant 72 degrees, a case could be made that these springs are the real fountains of youth. Gilchrist Blue Springs, which became the 175th state park in Summer 2017, offers visitors an opportunity to experience these unique natural features in a location that is at once within reach and delightfully remote. Gilchrist is roughly 90 minutes from Jacksonville by car, and two hours from Tampa and Orlando, making this easy weekend trip unmissable. Composed of five primary springs, the namesake gin-clear Blue Spring is the largest in the park, discharging 740 gallons or 100 cubic feet of water per second—or 44-million gallons per day. These ever-changing waters flow gently downhill about a quarter-mile to the Santa Fe River, creating a spring run and floodplain that supports a diversity of fish, turtle and invertebrate species. Snorkelers can spot redbreast and spotted sunfish, largemouth bass, bluegill, and channel catfish in waters with unparalleled visibility. From a jumping platform constructed above the spring’s main boil, visitors can plunge into refreshing 72-degree water before swimming back to shore to sun themselves on the 50-yard wide white-sand beach. Four other nearby springs within the park are smaller in scale but no less striking. 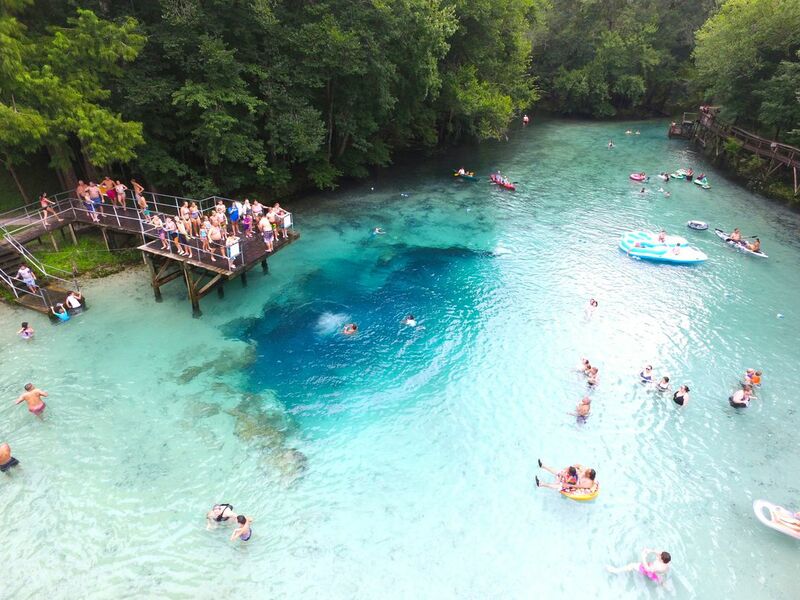 Johnson Spring and Naked Spring both provide secluded swimming holes, while the decidedly swampier Little Blue Spring holds court to an array of cypress trees and wildlife at its periphery, including wild turkey, whitetail deer and wading shore birds. Finally, Kiefer Spring is visible only when the water level reaches a certain threshold, which is more likely in Florida’s summer from May to October. Together, the rivers and freshwater pools that comprise Gilchrist Blue Springs afford ample opportunities for visitors to slow down and reconnect with nature. These winding riverways offer a tranquil track for canoeing, kayaking and stand-up paddling, while the trails and boardwalks that weave along the natural shoreline of the springs give hikers and bikers a full 26 miles on the Santa Fe River Canoe Trail. Fishing opportunities also abound here, and those who are inclined to linger will find plenty of places to set up camp; 17 RV-ready sites and another eight tent sites can be found on the property, and the park plays host to a variety of special events each month, including game nights and guided paddles. Nearby the town of Trenton brims with Southern folk art charm. 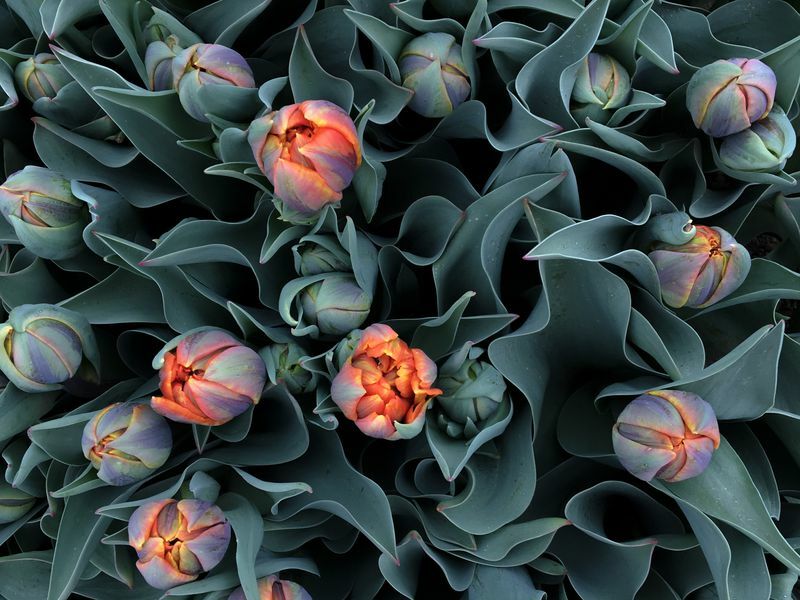 Known for its remarkably detailed quilting tradition, Trenton’s streets are dotted with shops showcasing local works. Get inspired at the Florida Quilt Museum, admire the quilt murals painted by Florida folk artist Janet Moses and, if you time your trip right, find yourself lost among quilting enthusiasts at Florida’s largest outdoor quilt festival in March.